This year was supposed to be the year of no commitments. I stopped accepting books for review (although, honestly, I already caved and accepted a couple from authors I've read previously...). I figured I'd be through my TBR pile by now. Yet, I have only managed to read six books so far in 2013. SIX!! And four of those were leftover review books I had from last year. So I haven't managed to even make a dent in my TBR pile! 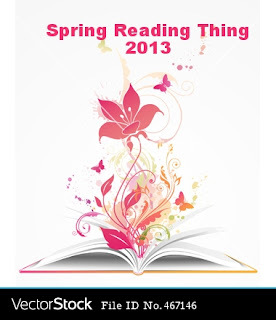 So I'm signing up for the Spring Reading Thing challenge to see if I can get myself back into reading. I'm sure this list will evolve over time, and that's okay according to the rules of this challenge. Hopefully I'll get through a good portion of my TBR pile, though. That's my main goal! Thanks! I'm really looking forward to finally reading several of these! I'm not familiar with these books so I'll have to check into them. Good luck with your reading. I've got Running With Scissors in my book basket but it didn't make it onto the list. Sigh. Enjoy your reading! I've had it for so long, I really hope I finally get to it this time!